Fraud involves deliberate deception for gain and is a civil wrong as well as being a criminal offence, so as well as leading to a criminal conviction, the defrauded person or organisation can also sue the fraudster to recover their losses. The fact that fraud is both a criminal offence and can lead to civil action for restitution means that the best approach to dealing with a case of suspected commercial fraud can vary a great deal. The most important thing to do if commercial fraud is suspected is to take legal advice fast. Stopping any losses promptly is of paramount importance, but a misplaced allegation of fraud can have disastrous consequences, so a very sure-footed approach is essential. If you have been a victim of fraud and have suffered financial loss, you need a team of solicitors you can rely on to defend your interests. Our team here at Selachii are specialists in litigation and take robust action on behalf of our fraud clients. Fraud is both a criminal offence and can lead to civil action for restitution. This means that the best approach to dealing with a case of suspected commercial fraud can vary a great deal. The most important thing to do if commercial fraud is suspected is to take legal advice fast. Stopping any losses promptly is of paramount importance, but a misplaced allegation of fraud can have disastrous consequences, so a very sure-footed approach is essential. At Selachii, our lawyers have exceptional experience assisting clients affected by fraud. Our aim is to help you achieve the best possible outcome for your circumstances. We can negotiate fiercely on your behalf, and where litigation is necessary, we use our advocacy skills, coupled with vast knowledge of the law and procedure, to design a case winning, tailor-made, strategy. To find out more about how we can assist you with your fraud case, please contact us. Fraud involves deliberate deception for gain, and is a civil wrong as well as being a criminal offence. As well as leading to a criminal conviction, the defrauded person or organisation can also sue the fraudster to recover their losses. We handle all kinds of fraud. However, our most frequent instructions come from those listed below. Money laundering involves pushing the profits of crime or corruption into legitimate assets to make money ‘clean’. You may have unknowingly accepted the proceeds of crime for payment and are now suffering the consequences, or have lost out to a money laundering scheme. We have experience of even the most complex money laundering cases and can help you today. We act for those who are victims of money laundering and also those facing civil money laundering claims. Mortgage fraud concerns providing false information to lenders to procure a mortgage, or larger mortgage, than the fraudster would be granted had the lender known the true circumstances. This may also involve the transfer of money by professionals in relation to a mortgage attained fraudulently. We regularly represent lenders, mortgage brokers, solicitors, accountants and individuals who have lost out as a result of mortgage fraud. Carousel fraud or missing trader fraud involved the movement of goods between businesses and even jurisdictions to avoid or claim back VAT. VAT carousel fraud is taken very seriously by HMRC with investigation becoming increasingly common. If you are suspected of involvement in a VAT avoidance scheme through carousel fraud, or have unknowingly been involved in a carousel fraud and lost out significantly, we can help. POCA gives courts wide-ranging powers to confiscate assets that are believed to be the from the proceeds of crime. The courts can make assumptions about how assets have been obtained, and assets that have been alleged to be from criminal conduct can be confiscated. Often, fraudulent trading cases will involve businesses which have become insolvent. If you are a creditor that has lost out financially as a result of a business that has ceased trading or gone into liquidation with unpaid debts, we can help. In addition to being a serious crime, false accounting can also cause significant loss to those involved in a commercial relationship with fraudsters. If you have lost money as a result of fraudulent trading, we can help. There are a series of measures we can take to prevent, mitigate and reclaim your losses. Theft in the workplace can take many forms and can cost your business a significant amount of money. Theft from an employer is not restricted to stealing cash but may be any misappropriation of an employer’s property including stealing goods or inventory, embezzlement, forgery and even trade secrets or intellectual property. Such thefts can be complex and may involve a network of individuals. If you suspect your employees may be involved in theft, it is important to act quickly. Contact our specialist team today. There are many illegal practices that fall under the category of antique and art fraud. Some are carried out by petty criminals who do not know the value of the items they are handling, and others carried out by those who know the industry well. If you have been misled or defrauded in relation to art or antiques, we can help. The benefits system is not always straightforward, with a number of confusing rules and obligations. You may be facing benefit fraud accusations or a DWP interview where it is believed that you have knowingly claimed benefits that you have not been entitled to. If you find yourself facing these accusations, you may be concerned about having to repay large sums of money, but our lawyers can help. Digital or cryptocurrency is an evolving technology, but are an entirely legitimate source of funds. The first digital currency was bitcoin, and it is becoming increasingly popular. As bitcoin is unregulated, there are some scams that you may have been the victim of under the head of bitcoin fraud. Selachii is expert in Bitcoin and cryptocurrency, and fully understand all of the means used by fraudsters. We can assist you in reclaiming any loss as a result of bitcoin fraud. Binary trading fraud normally occurs in a similar way to share fraud scams whereby the fraud is carried out through cold-calling. Many of these scam businesses can seem very legitimate, with websites and sophisticated trading platforms set up, allowing you to see your alleged ‘profits’. However, individual investors have lost upwards of £1million in these scams, and if you have lost out, it is essential to act quickly to recover your losses. Wine or diversion fraud normally involves importing or exporting wine, beer or spirits in a way that allows the importer to avoid inward or outward excise duty. If you have lost out as a result of wine fraud, contact our team today. Typically, share and investment fraud occurs in “boiler rooms” called as such because they create a high-pressure sales environment. Such scams are often very sophisticated with those carrying out the fraud getting to know their client’s affairs before attempting to carry out the fraud. If you have lost out to a boiler room shares or investment scheme, it is crucial to act quickly to mitigate your loss and have the best chance of recovery. Contact Selachii now, speed is of the essence. We have a proven record of recovering assets from scammers across the world, even in cases in which the company which carried out the scam is insolvent. Our international litigation expertise and ability to act fast are crucial strengths in maximising the possibility of a successful outcome, minimising the loss if possible and obtaining speedy restitution. Fraud is an issue that demands extreme tact as well as often needing great doggedness and attention to detail. Because every scam is different, we know you'll need a tailor-made solution. We don’t believe in simply handing out one-size-fits-all solutions to problems. We will focus on your specific circumstances before working out the best and most cost-effective way of helping you achieve your aims. 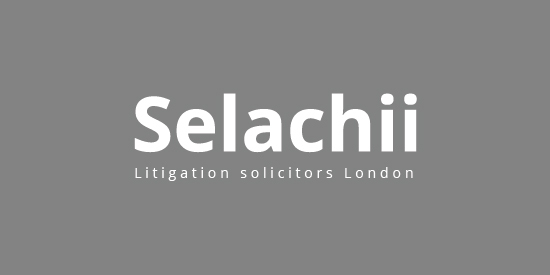 Selachii is a dynamic litigation law firm based in Kensington, London. We put the best interests of our clients at the heart of everything we do. We work with both businesses and private individuals, giving them legal advice and support which is unique to them and their situation. Contact us today on 0203 811 7723. Whether you have suffered a fraud or been accused of one, Selachii has the expert knowledge and experience to protect your interests in the strongest possible manner. Commercial fraud can affect companies in many ways. Most frauds are 'insider frauds' that are perpetrated by people within the business, using their position of authority or access to accounts etc. to commit their deception. A typical fraud is to set up a false supplier account and then pay fictitious invoices from the fake supplier. With insider frauds, there is a delicate path to tread in terms of obtaining the evidence necessary to prove the deception, making sure that a false accusation is not made and safeguarding your assets. We can advise you step by step on the best course of action to take. Although somewhat less common, 'outsider frauds' are often more serious than insider frauds, as the latter often involve small amounts over a long period and the former are often 'one-offs' for much larger amounts. Good fraud prevention is clearly the essential. However, in the event that a fraud is uncovered, the need to safeguard assets, prevent further losses and collect evidence is paramount. This may require swift action to trace the whereabouts of the assets extracted by the fraud. Frauds are often complex and dealing with the legal issues of fraud cases demands experience and expert knowledge. Fraud is an issue that demands extreme tact as well as often needing great doggedness and attention to detail. We don’t believe in simply handing out one-size-fits-all solutions to problems. We will focus on your specific circumstances before working out the best and most cost-effective way of helping you achieve your aims. To speak with a solicitor now call 02077925649 or email info@selachii.co.uk If you have been accused of benefit fraud at any time, or fear that you may have a problem because of it, as practiced benefit fraud solicitors based in London, we can help with all aspects of this. Selachii solicitors London based legal team is well used to dealing with fraud allegations in all its many forms. If you are worried that you may be have to face dealing with the Serious Fraud Office, HM Revenue & Customs or even SOCA (Serious Organised Crime Agency), we are. Tax fraud is the deliberate evasion of paying taxes made by individuals, companies and trusts. This illegal activity typically involves taxpayers deliberately being dishonest about tax reporting in order to pay less tax. The evasion of taxes might be carried out in one of several ways, including declaring less.